via The new NADCA ACR 2013 air system cleaning standards are finally here, Arizona!. After a long review period, the new NADCA ACR 2013 has been published and is being integrated into DUCTZ of North Phoenix and Deer Valley cleaning protocols. While many of the standards have remained the same, there are some critical sections that have been changed that will immediately impact how an HVAC air system must be cleaned. Want to make sure your current (or upcoming…) projects are in compliance? Visit the NADCA website at http://www.nadca.com and call us at 623-466-8625 for more info. DUCTZ Project managers are standing by to explain the changes and help you with your projects! Don’t let the dust get you down! Our patented cleaning process helps your air system run at peak efficiency, and will get that dust out of your air! Don’t wait until you are buried by dust – call us today at 520-343-4355 or 623-466-8625! One of the valuable services we provide for our Maricopa and Pima County customers is rat removal. Living in the desert, we share our environment with many animals, some more dangerous than others. Rats of all kinds (roof rats, pack rats, kangaroo rats, field mice…) look for a nice place to live and this time of year are looking to find a nice, cool place to live and nest. If you suspect (or you know…) that you have had a rat family move into your home air system please call us at 623-466-8625 or 520-343-4355. Not only are rats of all kinds capable of causing thousands of dollars of damage to a home or business but they can carry some pretty nasty disease causing microbes – the dead carcass is usually the least of a homeowner’s worries. If you have a friend or client who has had a rat penetration into their home (or pigeons, don’t forget the “rats with wings”…) please call us or visit our website at http://www.ductz.com/servicesrequest.html to request service. DUCTZ was called by museum management to restore the clean air to 5 air systems at this historic home. Built in 1895, it houses memorabilia from the ranch in a walk through museum format. DUCTZ was called because of our expertise in dealing with retrofitted air systems in old buildings and our ability to work around very expensive antiques without damage. Thanks to our skilled air duct restoration technicians the Ranch visitors will now enjoy clean air again! Looking for a licensed air duct cleaning company in Scottsdale? Check out our Angie’s List review! 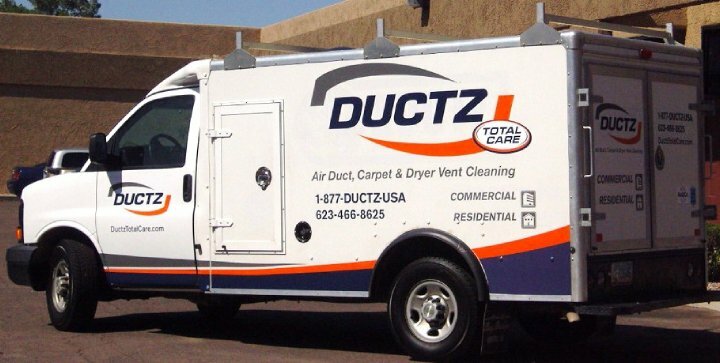 Everyone knows how dusty our homes get in Arizona, but how does a homeowner know that they are going to get the duct cleaning service they pay for? Check out our recent review from one of your neighbors on Angie’s List!